It has predicted a global unemployment of 202 million in 2012, a rise by 3 percent from last year. While it was observed that governments mostly fail to cut deficits, they risked fueling unrest unless they combined tighter spending with job creation. 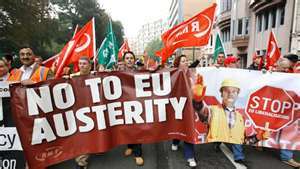 “The strategy of austerity actually has been counterproductive from the point of view of its very objective of supporting confidence and supporting the reduction of budget deficits,” according to Raymond Torres, director of the ILO’s Institute for International Labor Studies. ILO has warned that the global employment situation is unlikely to improve soon. The agency said that austerity measures, especially in advanced economies, were hurting job creation. “The austerity and regulation strategy was expected to lead to more growth, which is not happening,” said Torres. The report said some 50 million jobs had disappeared since the 2008 financial crisis. The ILO said the situation was likely to get worse amid slowing global growth and more people entering the workforce. High unemployment has been a concern in the US and other major economies and has hurt the global economic recovery. It warned that trends were especially worrying in Europe, where nearly two-thirds of countries had seen unemployment go up since 2010. The ILO report comes at a time when some of the biggest economies in the euro-zone are having to cut government spending in wake of the region’s ongoing debt crisis. The agency was critical of the austerity measures taken by Europe’s economies, saying not only had they failed to bring down deficits but they had hurt economic growth and as a result impacted the jobs market. It said labor market recovery had also stalled in major economies such as Japan and the United States. A growing and better-educated workforce was meanwhile struggling to find enough good jobs in places such as China, while workers still faced acute job shortfalls in the Arab world and Africa, it added. Torres, the report’s lead author, came down hard on Europe, accusing it of ‘ill-conceived fiscal austerity’. The ILO warned that a ‘new and more problematic phase’ was emerging in the global labor market. It said that more than 40 percent of job seekers in advanced economies had been without work for over a year, indicating that it was taking much longer for people to find jobs. At the same time, the agency noted that youth unemployment had been rising in both developed as well as developing economies, a trend which it warned could have far reaching implications.